For 2 OR 4 players. Luchador! 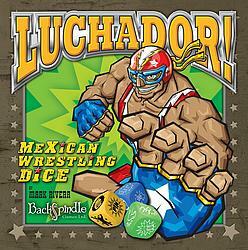 – Mexican Wrestling Dice is a fast playing dice game based on the exciting world of Professional Mexican Wrestling or “Lucha Libre” (meaning Free Fighting). It can be played by two players or by four players playing as two-man Tag-Teams. If a player’s Strength Score is reduced to zero (marked as KO on the Strength Score cards) or lower, their Luchador (wrestler) no longer has the strength to continue the bout and their opponent wins by a Knock-Out. the pinning player is declared the winner.